While I saw hordes of kids dressed to the nines in comic character outfits and neon hair attending the Bumbershoot Festival in Seattle while I was up there- I sadly did not see this fantastical "Biosphere Built for Two" by Vaughn Bell at the Kerfuffle exhibit staged as part of the Bumbershoot festivities. Vaughn also has some great terrarium-based works at his website- check it out! 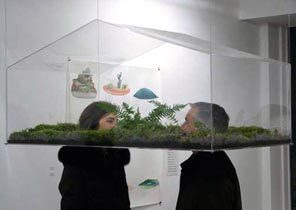 Vaughn Bell's "Biosphere Built for Two," a terrarium that you can poke your head into, is part of the exhibit "Kerfuffle: The Uneasy Relationship Between Humanity and Environment" at Bumbershoot.